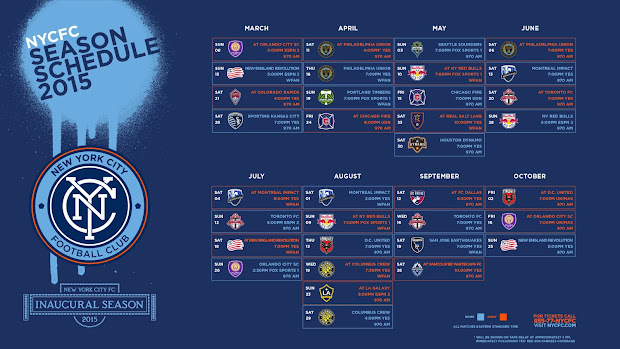 New York City Football Club, New York City’s new Major League Soccer Club, today announced its much-anticipated 2015 inaugural season match schedule. The schedule features 17 home games at the iconic Yankee Stadium in the Bronx. The Club will kick-off their inaugural campaign at Orlando on March 8, before hosting MLS Cup Finalist New England the following Sunday March 15 in the historic home opener. Both matches will be nationally televised on ESPN. The schedule features three matches between New York City FC and the Red Bulls. The first meeting between the two teams will occur on May 10 at Red Bull Arena, followed by the neighbors from New Jersey visiting Yankee Stadium on June 28. The third match will take place on August 9 in New Jersey. Other notable home dates include May 3 vs. Supporters’ Shield winners Seattle Sounders, July 26 vs. fellow expansion club Orlando City SC, and August 13 vs Eastern Conference regular season champions D.C. United. New York City FC will face off against the current MLS Cup holders LA Galaxy on August 23. New York City FC will be featured heavily on National TV with 14 of the clubs 34 total games shown on ESPN, Fox, and Univision Deportes. New York City FC’s local television schedule will be released at a later date featuring games on the YES Network. New York City FC games will also be available in English and Spanish in a partnership with CBS Radio and WFAN New York. All National TV times & listings are available on nycfc.com. 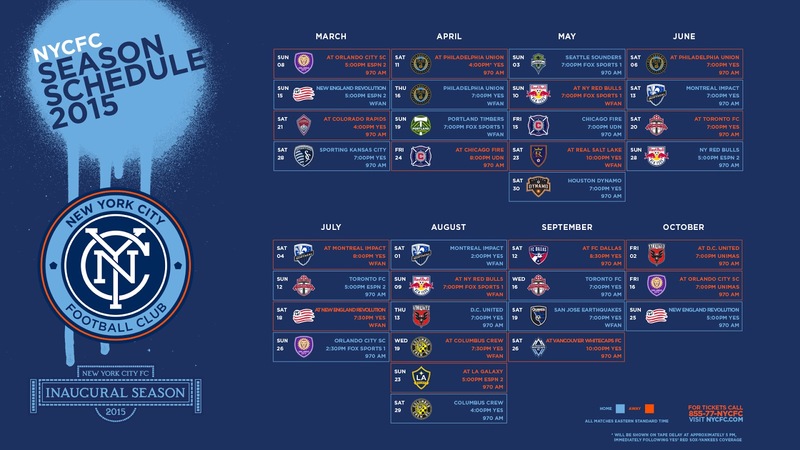 The full schedule, including all national TV times & listings are available at nycfc.com/schedule. Join the Club today, season tickets are available now by calling 855-77-NYCFC or by logging on to the team website at nycfc.com. Can't wait - I'll be in Orlando for the first-ever game and then in the Bronx to cheer on our Boys in Blue! Hope to see you there!